How could we have an impact on an old and enormous planet that's been regulated by natural processes for billions of years? It’s impossible. Thanks to humans, the carbon in the atmosphere has gone up by 40%. It's no surprise that would have a big impact on our climate. Carbon dioxide (or CO2) is the familiar gas that bubbles out of carbonated beverages, and in its solid form it's called dry ice. Carbon dioxide is also a waste product of animal metabolism, after oxygen from the air is combined with carbon-containing compounds in food to produce the energy we need to live. In a beautiful carbon cycle, plants take in carbon dioxide and solar energy to live, and they "exhale" the oxygen that we need to live. For most of human existence, the amount of CO2 in the atmosphere has been stable at about 280 parts per million (ppm), meaning that out of every million molecules in the air, 280 of them are carbon dioxide. It's a pretty small fraction of the atmosphere (0.028%), but it's the right amount of carbon dioxide to absorb just enough heat so that the Earth has the overall average temperature that we and everything else have gotten used to. Then came the Industrial Revolution, when we learned to make the great amounts of electricity and heat needed to build modern civilization by burning "fossil fuels," or coal, oil, and natural gas (methane). Fossil fuels are the remains of plants and animals that died millions of years ago and sank to the bottom of stagnant water that lacked the oxygen needed to decompose them. They became buried under layer after layer of sediment and compressed into coal or oil. Today we mine that coal and drill for oil and then burn them in power plants and cars. Fossil fuels are mostly made of carbon, and burning them turns them into carbon dioxide that goes up the smokestack or out the tailpipe and into the atmosphere. This is the extra carbon dioxide, beyond that nice amount we used to have when the carbon cycle was in balance, that is causing global warming. Carbon dioxide doesn't just go away; it builds up in the atmosphere (Figure 1) and traps more heat and makes the planet warmer. The amount of carbon dioxide in the atmosphere in 2010 was 390 ppm, which is up 39% from pre-industrial levels, and it's increasing at a rate of 1.9 ppm/year as more and more humans burn more and more fossil fuels. It's astonishing that humans can have such a large effect on the whole planet's atmosphere, but it's a fact that they do. 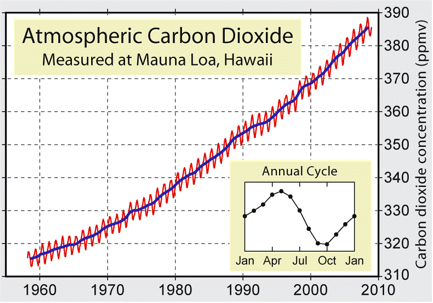 Figure 1: Concentration of atmospheric carbon dioxide measured at Mauna Loa, Hawaii from 1958 to 2009. The red curve shows monthly measurements of CO2 concentration in parts per million (ppm), and the blue curve is the annual average. Figure from published data created by Robert Rohde/Global Warming Art.